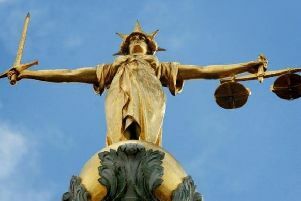 A man told a court that being further remanded in custody gives him time to “preach the Gospel”. Joey McAuley (48), of no fixed abode, Ballymena, was speaking via video link at the town’s Magistrates Court on Thursday from Maghaberry Jail. He is charged with being disorderly in Wellington Street, Ballymena, on November 28 this year - a day when graffiti saying ‘Bless this place Lord’ appeared at a former Presbyterian church on the street which is currently being demolished. McAuley’s bail was revoked earlier this month when an address he had given did not exist and during his court appearances he has made a number of religious references. At Thursday’s court, Deputy District Judge Liam McStay told McAuley - who is self-represented - that if he had a lawyer it would help his case. McAuley said getting bail did not matter as it means he has “some time to preach the Gospel of Jesus Christ”. He insisted he had not done anything wrong, claiming there was “no justice,” before further telling the court: “I forgive you”. A prosecutor said the case is listed for a contest in February but there would be a further mention of the case on January 26. McAuley was further remanded in custody until then. At the same court, on December 15, when asked if he obtained legal representation, McAuley said: “Aye, Jesus Christ”.